In homemade how-to number 6, I showed you how to cook fluffy, foolproof baked potatoes that can even be made ahead. 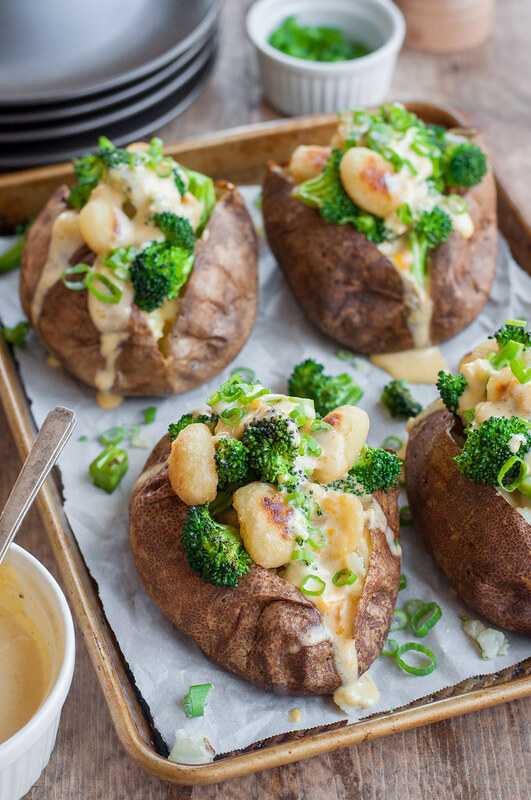 Gnocchi and cheese baked potatoes are a decadent dinner with a lightened up cheese sauce to put your new skill to work! It’s potato madness: baked potatoes and potato gnocchi meet in a ridiculous, over-the-top, must-try comfort food dinner. Let’s just say this would be a good one to reserve for after a big athletic event. Or when you’re stuck inside and in sweatpants on a rainy day. Or…tomorrow night. If you need a redeeming factor for all that cheese, the recipe boasts a significant pile of broccoli for color, health, and the happiness of broccoli lovers like me. Broccoli and cheese: always better together. Always betters with carbs. While this meatless main dish or somewhat obnoxious side dish is a bit decadent, the cheese sauce isn’t the worst splurge. I wouldn’t go so far as to call it “skinny” or “healthy”, but “lighter” might be a fair interpretation. I’ll let you be the judge: The liquid is split 50/50 between cream and almond milk, and it’s gluten free. Many cheese sauces contain flour in the form of a roux, but, as I discovered in my latest favorite mac and cheese recipe, you needn’t go through the trouble of all those dirty dishes and utensils or long list of ingredients for the creamiest, smoothest cheese sauce you’ve ever tasted. 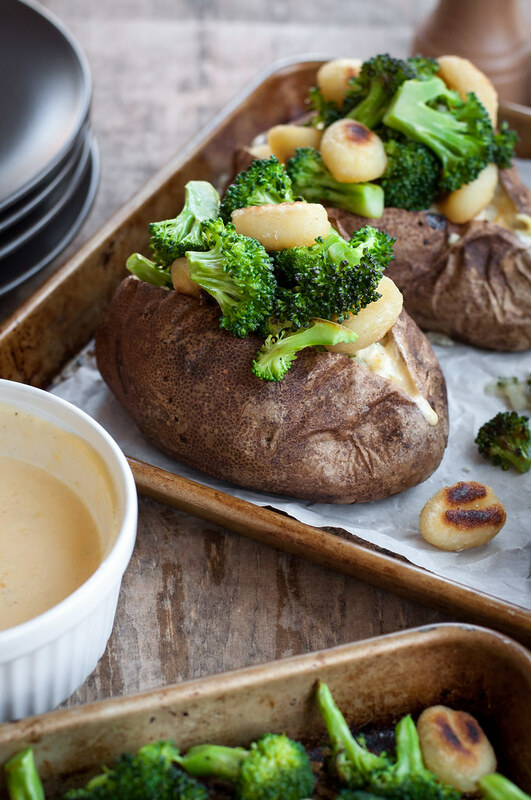 After making these cheese sauce as simple as it gets, I got a little obsessed with streamlining the rest of the recipe so you can enjoy these decked out spuds even on a busy weeknight. 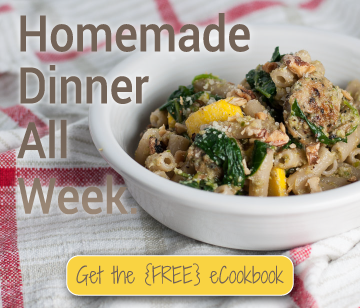 I know, it doesn’t exactly look like a weeknight recipe, but hear me out. As you’ll learn in my perfect baked potato tutorial, you can make the potatoes ahead and still have them nice and fluffy a few days later. The broccoli is chopped small enough that it cooks in minutes on the stovetop, and then comes the real kicker. There’s no giant pot of boiling water to contend with just for the sake of cooking a cup of gnocchi. That’s right: heat up some olive oil in the single skillet you use for the entire recipe (one pan dinner!) and toss in your pasta. Five minutes later, you have crispy-on-the-outside, tender-one-the-inside gnocchi without the slightest raw taste. After testing and photographing this recipe, my hubby and I stood around the photo setup at 4 PM on a Saturday just scarfing gnocchi dipped in cheese sauce. Who needs chips and salsa when you have that going on? The only thing I need now is two-a-day workouts for the next week. Rounding out the quick meal factor, after pan frying my gnocchi, I wiped out the same skillet and made cheese sauce in it, which easily took under 10 minutes. 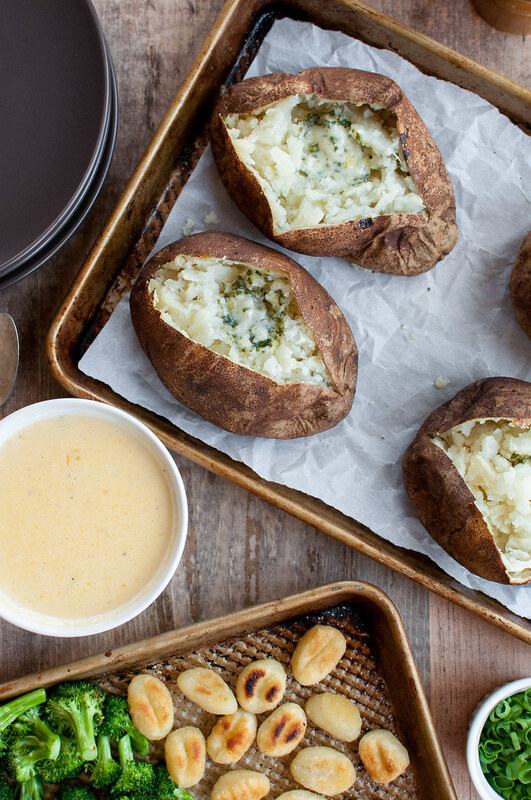 I love to cook and I don’t think every dinner must require 30 minutes or less, but if you make the baked potatoes ahead of time, I think this one could truly clock in under half an hour. After all this talk about gnocchi-topped baked potatoes as if it’s a normal dinner, I have to concede that the idea is a little crazy. Crazy and must-try, which is what I was thinking as I ordered a much fancier version of it at Austin’s Foreign and Domestic on my honeymoon last fall. You can see the pictures of the meal that inspired my gnocchi and cheese baked potatoes in this post, along with some of our other delicious Austin eats. It was exactly the kind of restaurant meal I love, which can be hard to come by: familiar with some serious culinary flair, fun to eat, memorable, and an inspiration to everyday cooking. Vegetarian. 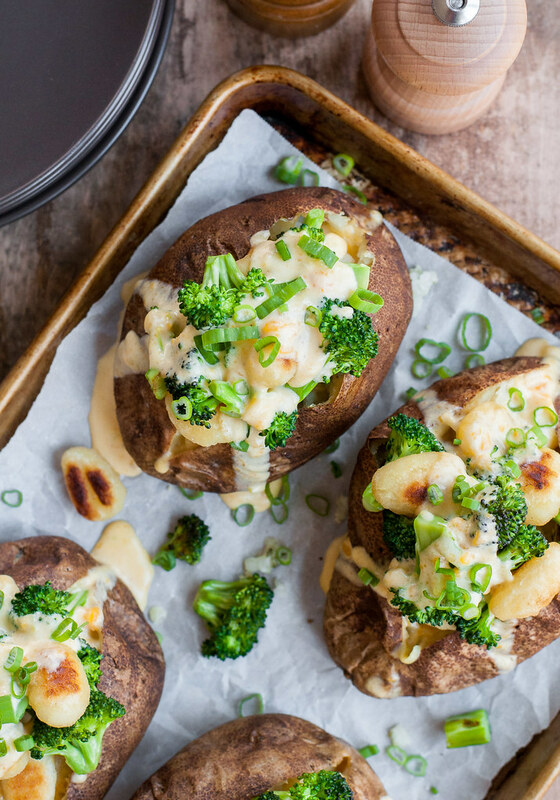 The ultimate cheesy baked potatoes, topped with pan seared gnocchi (no boiling required), crunchy sautéed broccoli, and a quick, lighter cheese sauce. Have potatoes opened and kept warm in the oven, covered loosely. Set cheese out at room temperature so it softens a bit. Heat 1 tablespoon oil in an 8 to 10 inch skillet (preferably cast iron or nonstick) over medium high. Add broccoli and stir every minute, covering in between. When broccoli is bright green and just tender, season with salt and remove to a rimmed baking sheet. Heat another tablespoon or two of oil in the same pan (enough to thinly coat the bottom), then add gnocchi and spread in a single layer. Cook about 3 minutes, covered, without stirring, until browned on one side. Uncover and flip gnocchi over, then cook another 3 minutes (uncovered), stirring occasionally, until golden brown all over. Sprinkle with salt and add to the pan with the broccoli. Wipe the skillet clean. Pour in the cream and almond milk (if using), stir in white and light green portion of scallions, and heat over medium, increasing heat gradually if needed, until the mixture just boils. Turn off heat, add cheese, and whisk until cheese melts. Season with grated nutmeg, salt, and pepper to taste. To serve, stir a little butter into each potato. Top with cheese sauce, a generous pile of broccoli and gnocchi, more cheese sauce, and a sprinkling of scallion greens, salt, and pepper. 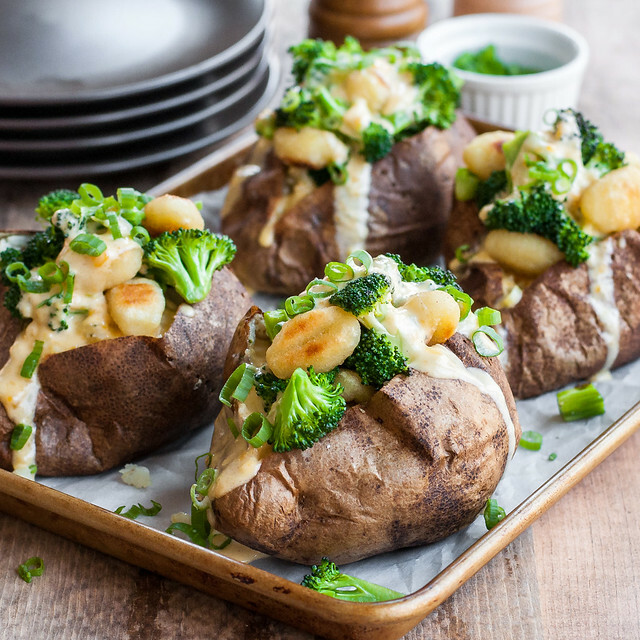 Serve any of the broccoli and gnocchi that didn't fit on top of the potatoes on the side, with any remaining cheese sauce. Cheese sauce makes about 1½ cups. Prep and cook time does not include baking potatoes. They can either be baked ahead or mostly baked during the prep time for the rest of the recipe. For nut allergies, replace the almond milk with additional heavy cream or a nut-free non-dairy milk. Note: This page contains affiliate links. It does NOT contain sponsored content. Affiliate links (to products I recommend, on Amazon) offset my ingredient and website maintenance costs, so I can keep bringing you potato-filled recipes like this one. Thanks!